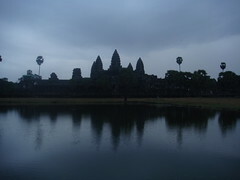 Is Angkor in danger of sinking, or isn’t it? The consensus among the scientific community is that the strain on underground water resources is unacceptably high, but the Cambodian government is saying, “not just yet”. The problem’s not new – with Angkor rising in popularity as a tourist spot, the nearby town of Siem Reap has experienced an unprecedented tourism boom as hotels and associated businesses set up shop to accommodate the tourists by the thousands. With the rush of human activity comes associated problems of pollution – blackening of stones caused by the exhaust of buses, and the escalated drawing of underground water is threatening to destabilise the ground on which the temples stand. Sadly, the most high-profile victim of Cambodia’s success in tourism could well be Angkor Wat itself. The World Bank report added that “one of Angkor’s temples is reportedly falling into a sinkhole, suggesting that the underground aquifers may be rapidly disappearing”. The monument in question was the Bayon temple, famous for the delicate faces carved on to its 54 towers. It is reportedly still collapsing into the sandy ground and visitors can observe its sinking foundations and widening cracks. The cultural specialists now claim that if it is happening there, it could happen anywhere. Not particularly reassuring, I think. Although there’s now a plan to draw water from an underground source away from Siem Ream and Angkor, which would alleviate the problem.